Entering the Challenger Learning Center of Northwest Indiana in Hammond, the first view is of the space exploration mural adorning the walls, honoring our nation&apos;s astronauts. The mood was set by one of the program directors informing us and a group of students how the facility came to be. The northwest Indiana center is one of 48 across the country entrusted to carry on the educational mission started by the Challenger Shuttle crew which included the first teacher in space, Christa McAuliffe. The South Shore CVA staff was sent off to the briefing room to hear about our mission, set in the year 2076. Half the crew has manned Mars Control for 2 years. The other half, Mission Control, is on a 6 month voyage to Mars to relieve them. I had the opportunity to be on team that started as Mission Control. We were taken through the "air lock system" and took our team posts on the ship. 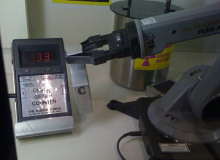 We monitored the crew&apos;s health, tested filters for radiation, gathered and tested samples while communicating our results to Mars Control. 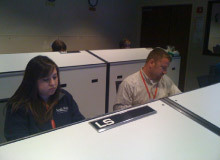 We watched the monitors as we traveled and listened to communications from Mars Control over the speakers. We had a few mishaps - the probe team blew something up in isolation and came out of their chamber with steam billowing into the room. And one of the air filters I was checking had extremely high radiation levels which added 3 months to the departing crew&apos;s trip back home. Luckily our team of "highly trained professional astronauts" were there to fix the problems. Once our team arrived on Mars, we left our ship and entered Mars Control. Our task was then to monitor the takeoff of the departing crew. We were notified by Houston that a sand storm was approaching which can last a few hours to a few years. With food supplies low, they made if off Mars just in the nick of time. The Challenger Learning Center has a wide variety of educational and entertaining programs. Many of the local schools take field trips to the center where students have a hands-on science experience with simulated missions, science activity labs and the micronauts programs. They also offer summer and weekend adventures with Indiana Space Adventure Camps and birthday parties; and for the whole family you can enjoy the family science, astronomy and planetarium nights. The South Shore CVA staff had a great time experiencing first-hand what Challenger Learning Center of Northwest Indiana has to offer. For more photos of our mission, visit us on our facebook page. 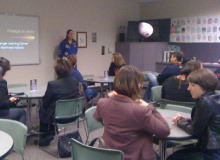 For more on all the programs Challenger Learning Center has to offer, visit www.clcnwi.com or call 219-989-3250.